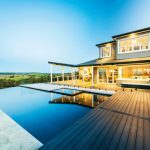 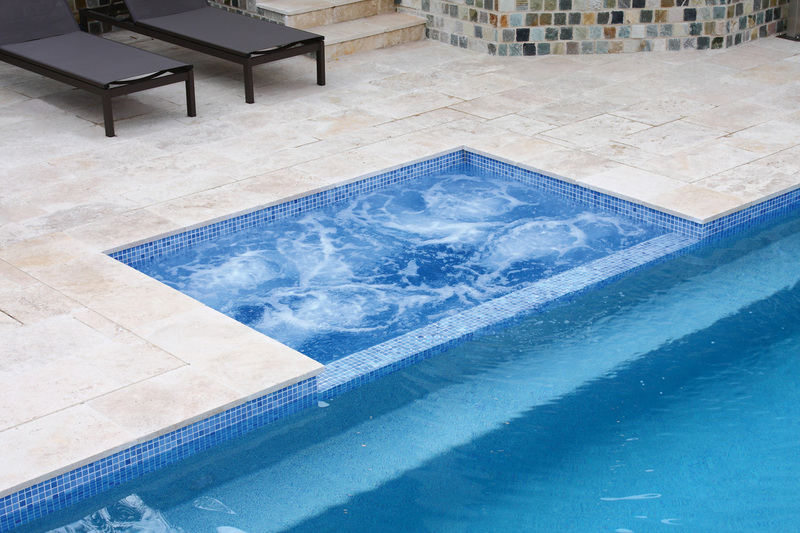 Award-winning builders at Jade Swimming Pools have once again managed to create something striking out of a difficult space. 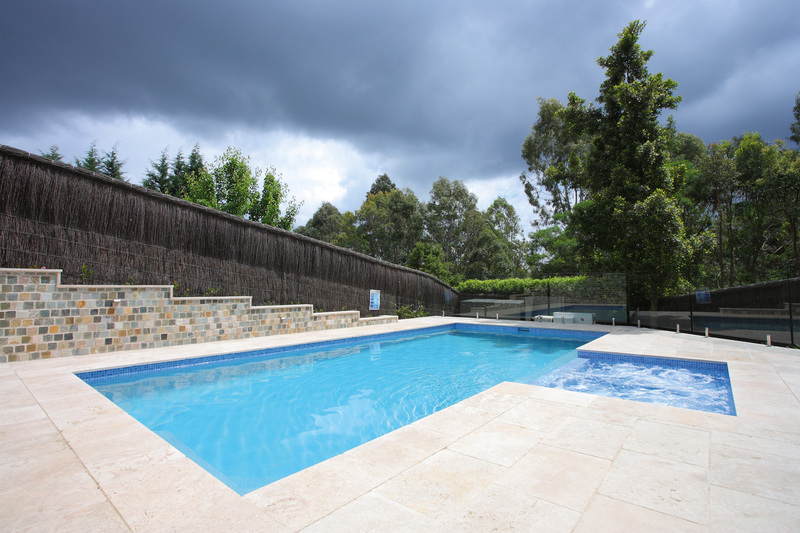 Designed to take advantage of the neglected side yard of the owner’s property that sloped away from the house, the end product is testament to Jade Swimming Pools’ excellence in high-quality clean design. 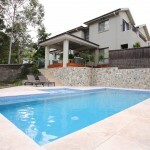 The new pool is now a focal point for personal use and an entertainment hub for family and guests. 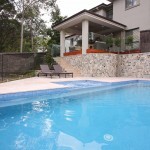 Natural stone materials in modern lines complement the contemporary build of the house. 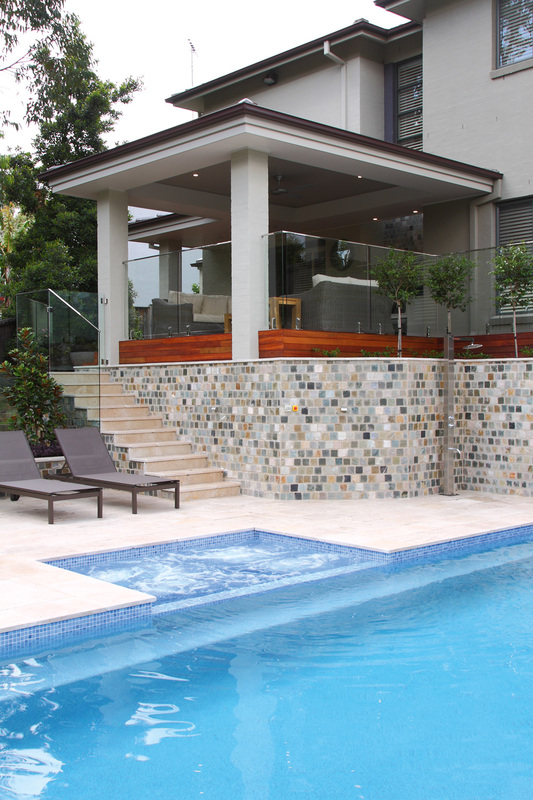 The unpolished travertine coping meets up with the slate mosaic retaining walls provided by Stone Exteriors, drawing out sandstone colours that bridge the divide between the house and the garden below. 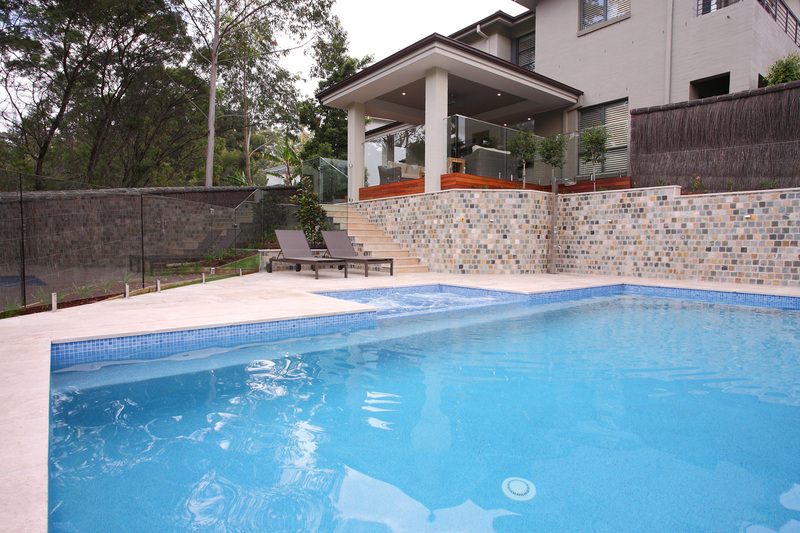 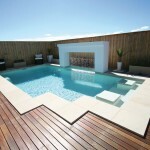 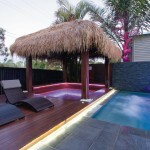 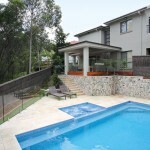 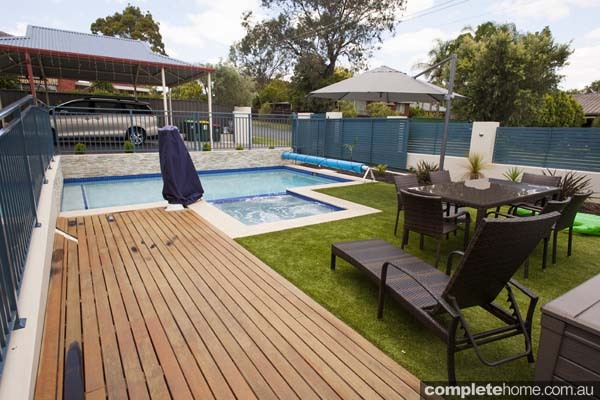 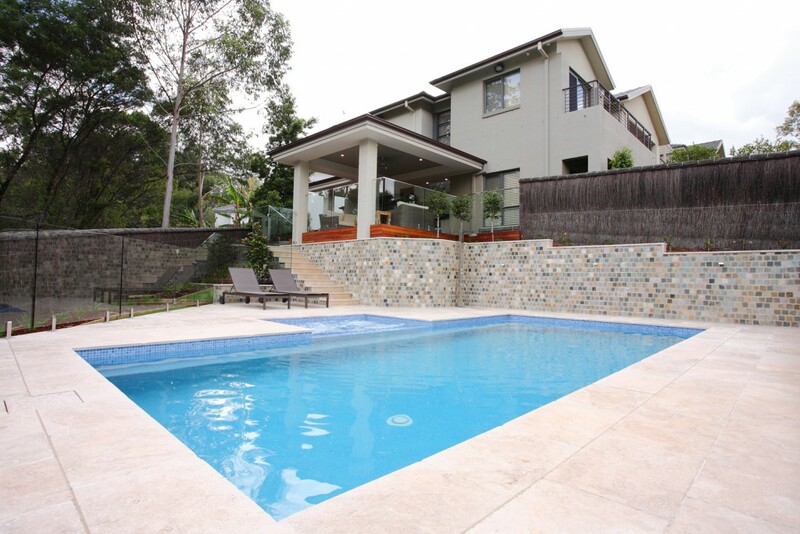 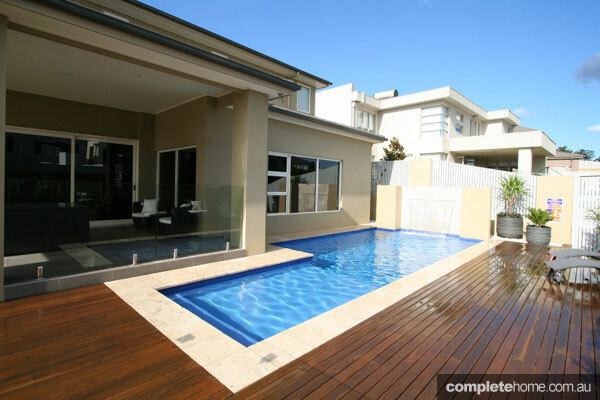 The placement of the pool takes advantage of the yard space as well as the view from the house and alfresco area. 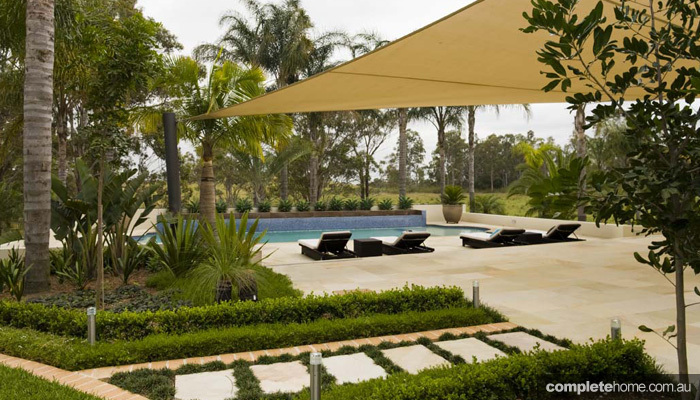 Glass fencing permits a visual sweep of the yard, letting the backyard feel spacious and inviting despite its many levels. 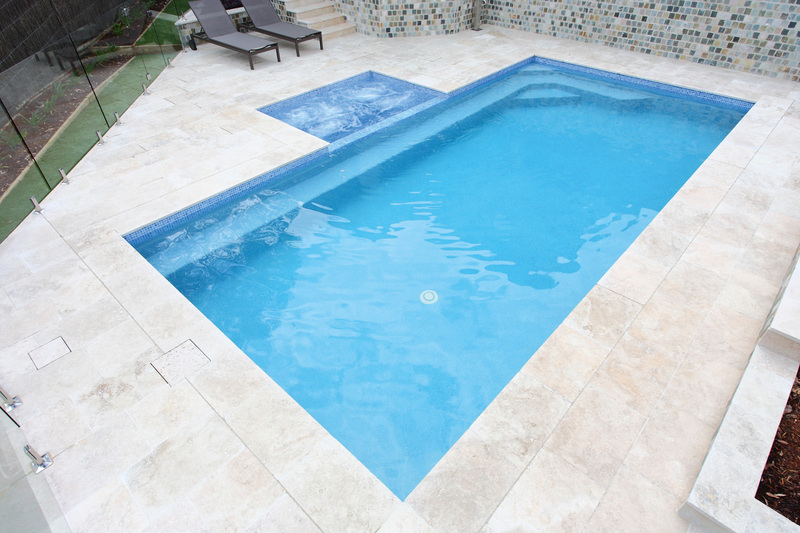 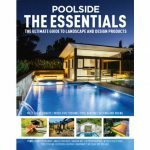 The pool’s classic lines merge the best of design and family needs. 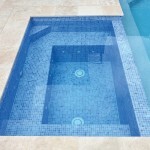 The in-floor spa seems to disappear within the water, reducing visual clutter over the surface, yet it shimmers like a gem. 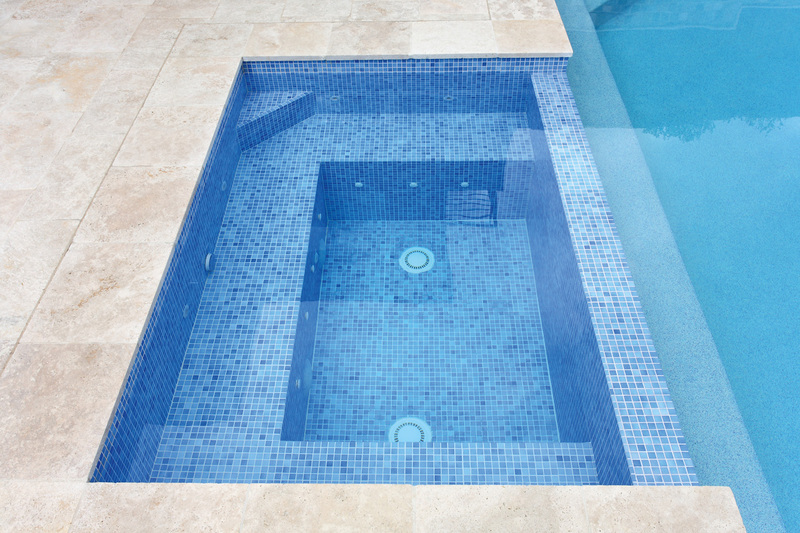 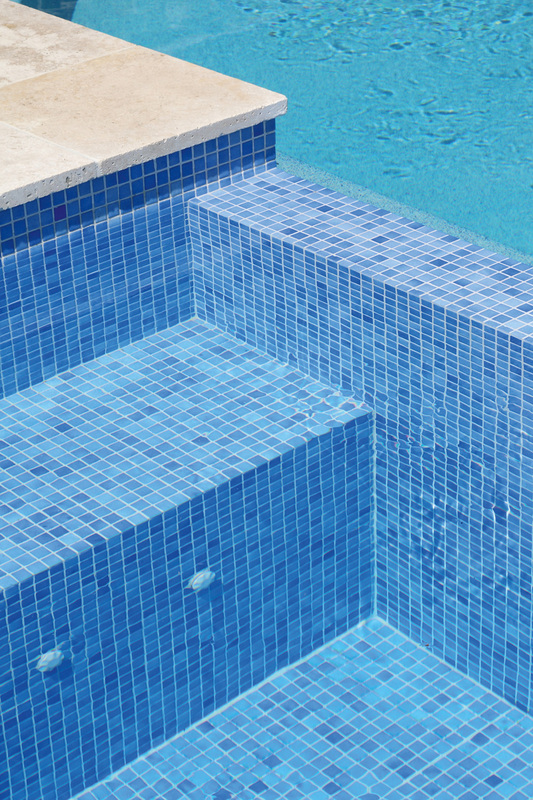 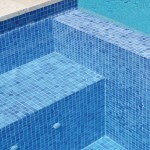 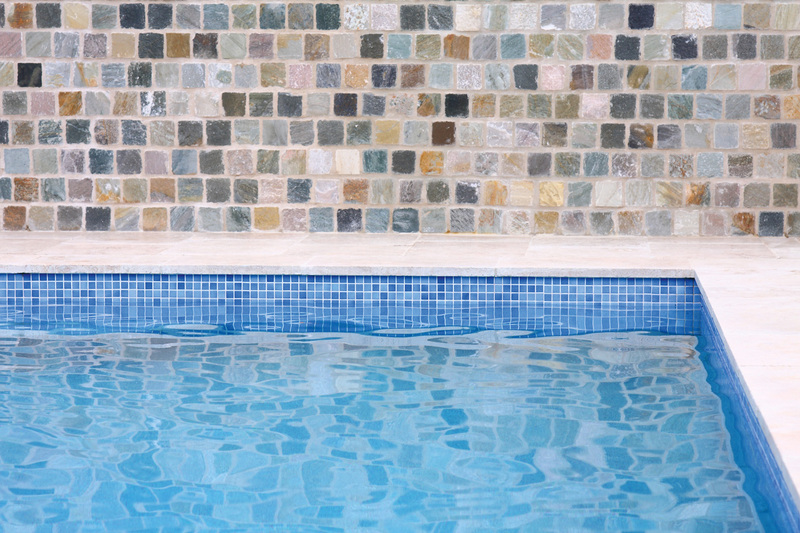 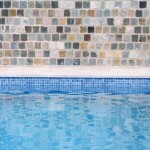 Tiled in the same blue mosaic that borders the edges of the pool, it provides subtle separation while allowing the pool to stand out against the travertine tile to become the area’s visual centrepiece. 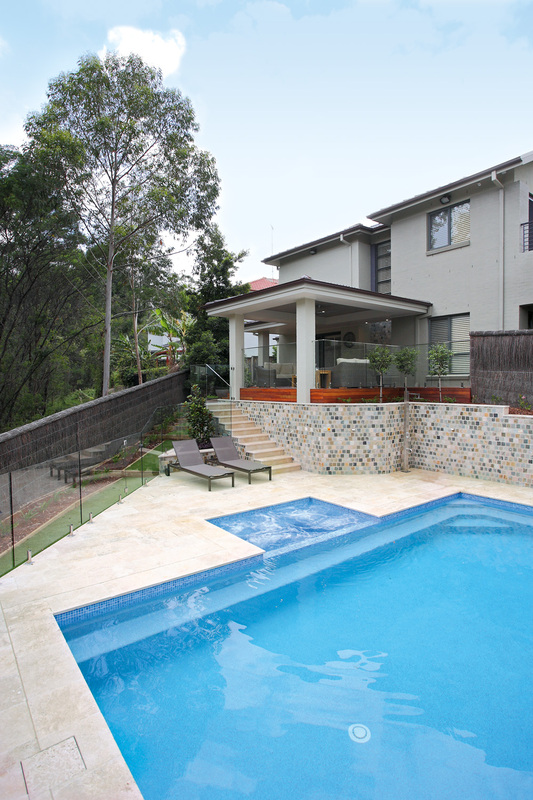 Steps along the edge of the pool are invisible from the direction the house, but perfectly situated for children to step safely into and out of the water. 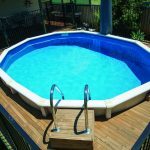 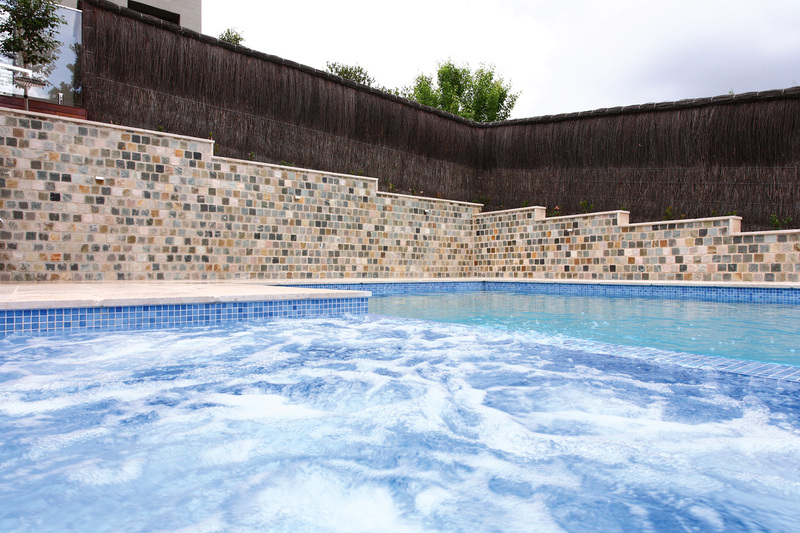 Their proximity to the spa also provides the ideal place for parents to sit and chat between spa and pool, and easily slide between one and the other if they so choose. 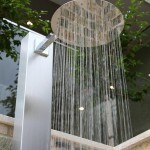 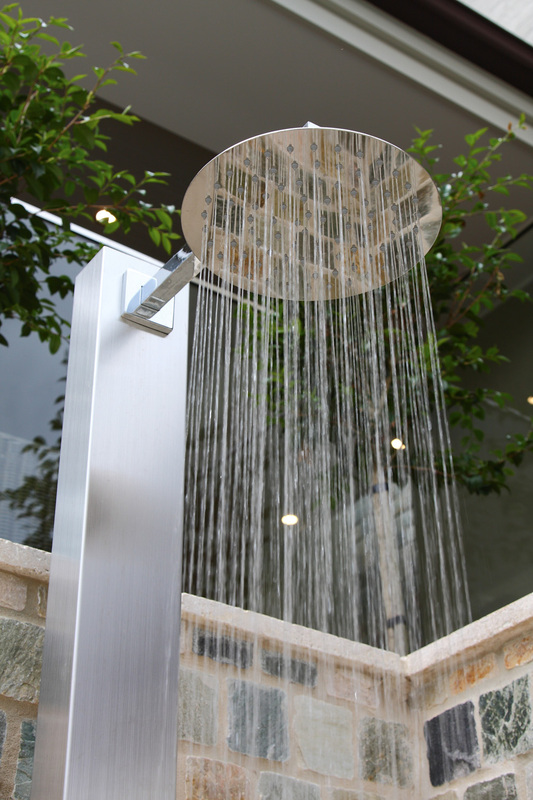 In combination with an outdoor shower and surrounding garden beds, this is a design that will work for the family and garden now and into the future.